You are here: Home / Hoppy Thoughts Blog / Classic Chicago and Delicious Beer On Tap at Motor Row Brewing Co. When I think of Chicago I think of a city in the Gilded Age. A time of growth, invention, and progress. A city of innovation and tycoons of industry. The first skyscraper, electricity, and the World’s Fair. I walked through Chicago’s Motor Row district. A historic relic of that bygone era, Motor Row was built with the dawn of the automobile. Car manufacturers sought to create a one stop experience for customers. A whole neighborhood dedicated to the sale and repair of autos. Walking down the street it was easy to picture it thronged with old model Fords, shiny Cadillacs, and vintage Buicks. With old Chicago on my mind I pulled the handle on the neighborhood brewery that paid homage to it all; Motor Row Brewing Company. Inside the taproom Motor Row Brewing successfully retained that same essence of the historic neighborhood it emulated. Rough brick walls were accented by a chrome bar top, silver hanging lights and a painted wall depicting classic cars rounded out the aesthetic. I found Alice standing under a large chalkboard that was half beer menu, half map of Chicago. She finished pulling a tap and happily greeted me. “We’re definitely lager focused.” Alice explained going over the menu with me. “To sum it up, we love mixing those European styles with American ingredients.” she added, readying a taster board. A veteran of the Vermont craft beer industry, Frank Lassandrello came to Chicago and was quickly captivated with its Motor Row district. Partnering with his father, Bob Lassandrello the two opened Motor Row Brewing in 2007 at a location in the heart of the neighborhood. Auspiciously they noticed the address they chose, 2337 S. Michigan Ave, spells out “beer” when the numbers are typed into a telephone keypad. The two combined their passion and know-how into a popular fixture of the historic district. 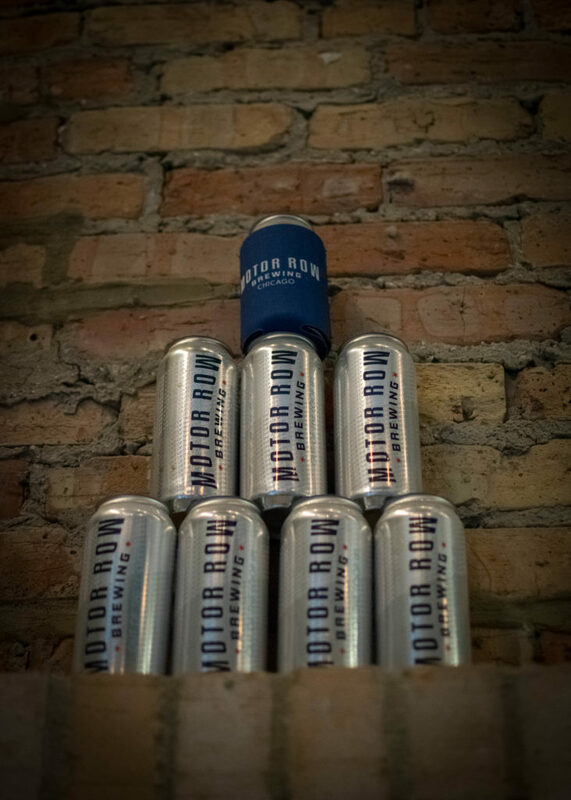 Reclamation Lager is Motor Row’s flagship beer and a go to option for anyone looking for an all day drinker. Reclamation combines the Old World Munich Helles style with American pilsner malt. The result is a lager, crisp, clean and refreshing as well as an exceptionally easy drinker. Fleetwood Black, brewed in the German Schwarzbier style is a popular black lager. Dark but medium bodied, rich malts mingle with flavors of chocolate and coffee. Despite its deep color, Fleetwood Black is surprisingly light and smooth. Intrigued, I picked up a taster of Dry Humor. A twist on the Belgian Blonde, it is brewed with locally sourced orange blossom and honey from Illinois’ own, Kress Apiary. The result is a tart and smooth blonde with a slightly sweet mouthfeel attributed to all that fresh honey. Jitters, another local mashup is a hard hitting imperial stout. It is caffeinated thanks to the addition of cold brew coffee from local roasters, Passion House. It also comes with a whopping 11% alcohol content courtesy of whiskey from local distiller, Almighty Spirits. Jitters packs a punch all around and is toted as a beer that’ll keep you awake but maybe not alert. Impressed with Motor Row’s lineup I complimented Alice on the beer. 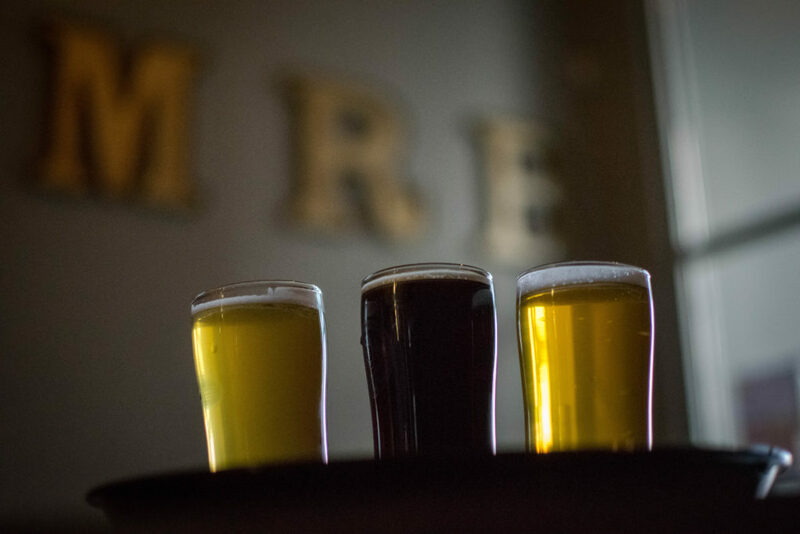 Held every Thursday, Motor Row Brewing hosts Blues and Brews, pairing some of their original Chicago beers with blues music group, The Original Chicago Blues All-Stars. I couldn’t think of a better way to make the whole Motor Row Brewing experience come together than with local Chicago blues and good beer in a historic city neighborhood. The Lassandrellos and Motor Row Brewing are masters of their craft. 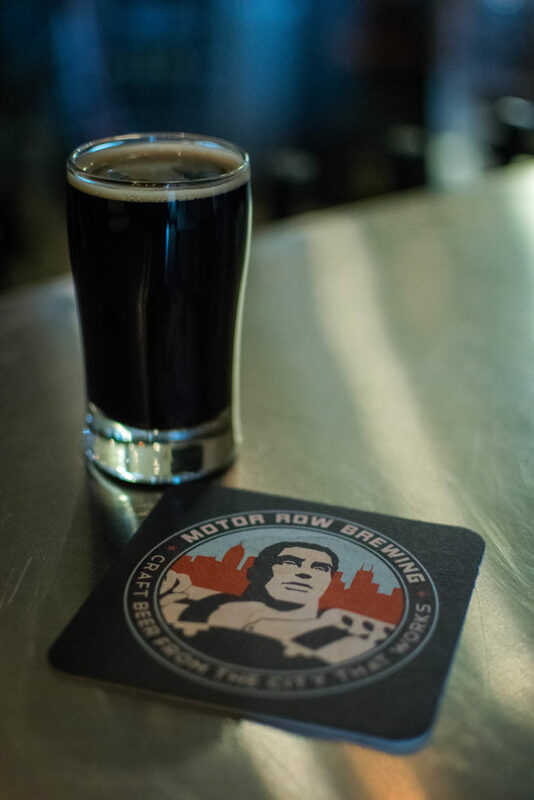 Solid brews in the traditional styles they love combined with the innovative addition of locally sourced ingredients makes Motor Row Brewing a must on any Chicago beer tour. Back out on the streets of the Motor Row district the world had moved to the modern age. Honda sedans, ringing smartphones, a Burger King right across the street. But behind me in Motor Row Brewing, Chicago’s Gilded Age of beer was in full swing. Looks like an amazing place, I will have to check it out on my next trip to Chicago!